With commercial gym equipment The cordless Precor 546 elliptical, the World’s most sought after exercise machine. You too can now afford this premium commercial grade, health club machine for your own home which features a no-impact, forward or reverse elliptical stride that lets you adjust ramp and resistance for cross training benefits. The Precor elliptical 546 allows you to stride smoothly while holding the handrails or moving your arms in natural sync, with or without hand weights. Commercial Gym Equipment can vary greatly. However with the Precor Elliptical The exclusive, electronically adjustable Cross Ramp lets you change the slope of the stride with the touch of a key to vary muscle emphasis. 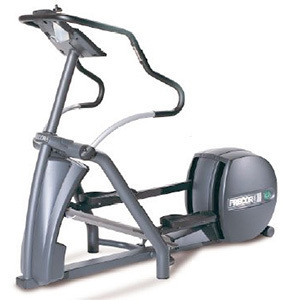 The 546 features sturdy construction, Precor’s adjustable CrossRamp®, 8 programs, and 20 resistance levels.